In 2017, the Utah Department of Environmental Quality and Gov. 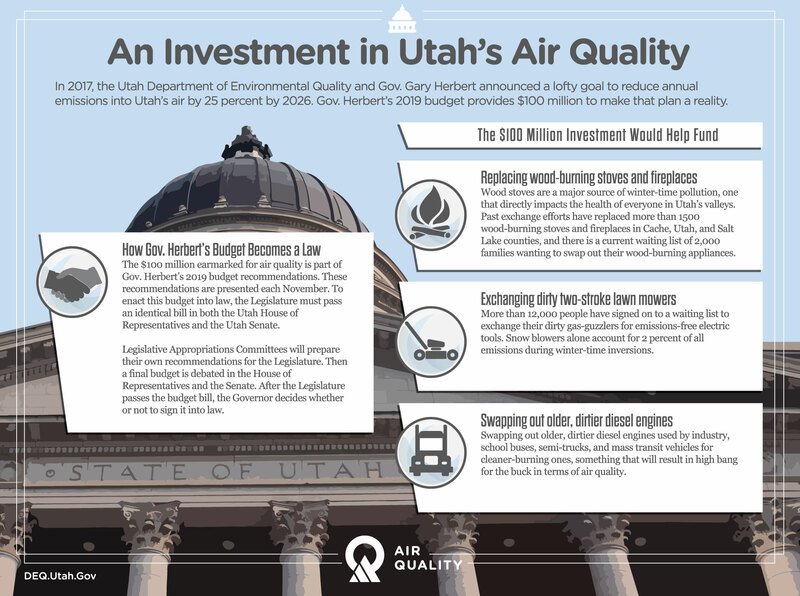 Gary Herbert announced a lofty goal to reduce annual emissions into Utah’s air by 25 percent by 2026 – an ambitious benchmark by any standard of measure, one made more difficult by Utah’s rapidly growing population. But goals are nothing more than wishful thinking if you don’t have a plan in place to actually reach it. And the governor’s 2019 budget provides $100 million to make that plan a reality. How exactly do we reach a 25 percent reduction? The governor’s plan calls on Utah citizens, businesses and industry to each do their part, and it involves a carrot much more than a stick. Yes, there have been meaningful steps in recent years. The Legislature, with the nudging of the governor, has provided funding for a new air monitoring center and a new lab, as well as public education campaigns and grant money for individuals and businesses to exchange dirty engines for cleaner ones. Replacing wood-burning stoves and fireplaces with cleaner-burning natural gas versions. Wood stoves are a major source of winter-time pollution, one that directly impacts the health of everyone in Utah’s valleys. Past exchange efforts have replaced more than 1500 wood-burning stoves and fireplaces in Cache, Utah, and Salt Lake counties, and there is a current waiting list of 2,000 families wanting to swap out their wood-burning appliances. Exchanging dirty two-stroke lawn mowers and snow blowers for electric ones. More than 12,000 people have signed on to a waiting list to exchange their dirty gas-guzzlers for emissions-free electric tools. Snow blowers alone account for 2 percent of all emissions during winter-time inversions. Swapping out older, dirtier diesel engines used by industry, school buses, semi-trucks, and mass transit vehicles for cleaner-burning ones, something that will result in high bang for the buck in terms of air quality. Encouraging state agencies to develop telecommuting plans for state workers, and remodeling state office buildings to be more energy efficient. 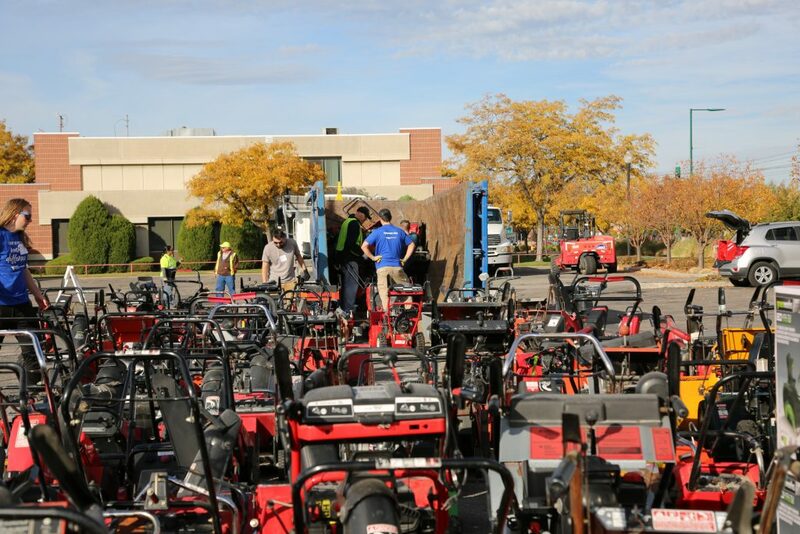 Last fall, Utah DEQ, UCAIR and Rocky Mountain Power helped exchange hundreds of dirty two-stroke snow blowers for clean electric ones. The governor’s investment provides the resources and tools to help make the 25 percent reduction a reality. And there is every reason to believe it will work. The steps taken to date — stringent controls on industry emissions, practical new regulations, cleaner technologies, and public education — have achieved remarkable improvements. In 2002, more than 2.5 million tons of pollution was emitted into Utah’s air, or more than one ton per person. By 2017, even as the population had exploded, total emissions had dropped to 1.7 million tons, only about a half ton per person. In other words, per-person pollution is about half today what it was in 2002. The challenge, of course, is that there are many more Utahns, and that number is expected to soar to 3.6 million by 2025. And each person, more than ever before, will have to do their part to make certain the air we breathe is healthy for one and all. The Utah Legislature will consider the Governor’s proposed allocation. You can visit our web site to follow the session. You can do your part by trying something simple to make clean air choices. For tips and suggestions, visit UCAIR.